From the time computers, LCD and television screens came into the picture, many of us have been adjusting ourselves to getting the perfect screening angle and view. It’s understandable as we all want to be well positioned to enjoy great screen time, hence why the use of the best monitor arm is essential. This is the perfect unit for holding monitors and other display screens as it eliminates the need to constantly adjust while making the necessary adjustments on board. They serve as a sustainable system for setting up a display screen and in some cases, more than one. The best monitor arms will have you well seated and comfortable during viewing and usage times. Take charge of your screen time with one of the following monitor mount arms that best suits your style of living. With the steady evolution of work and organizational structures, we see both individuals and organizations as a whole striving to adapt. Workplace productivity now depends largely on digitized mediums and how to keep in touch with the world at large. At the vast rate at which data is received and sent out, the need for monitor arms as support for our computer screens has risen. 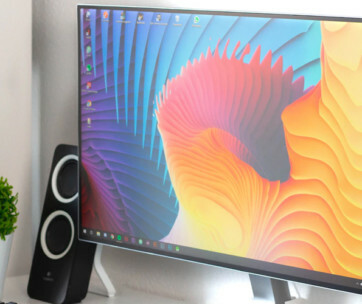 For this reason, it comes as no surprise why innovative designs such as the VIVO Dual LCD LED Monitor Desk Mount Stand are treasured pieces of equipment in many homes. The amazing thing about this dual monitor arm is its capacity to hold up two 13 to 27 inches monitor screens at the same time. The appropriate weight its capable arms can carry is about 22 lbs with 75x75mm or 100x100mm rear mounting holes. This monitor mount has arms that can be adjusted at a +80 to -90-degree angle with a 180 degrees spin and can be fixed at the back of your desk using a heavy duty clamp or a grommet mount. It allows a full circle 360 degrees alternation and the height can be accurately and conveniently adjusted from the centre pole. The icing on the cake has to be the removable clips that keep all AV and power cables pinned up on the arms or on the center pole. This in return clears up desk space and gives a rather organized look to your office as a whole. You can combine it with one of the ultrawide monitors from our list. It can be quite depressing always trying to angle up or down as the case may be to the level of your display screen. And at the end of the day, maintaining a good sitting posture is extremely important. You may not be trying out for a pageant but a good posture facilitates a healthier body and convenient and quality work experience. Take charge with the help of the AmazonBasics Premium Single Monitor Stand that extends and revolves easily for convenient use. The arms can be lengthened and pulled back at will and should definitely come in handy if you work late or read into the night. You can easily navigate the arms to tilt the screen and improve general visibility; the arms are also rotatable from a landscape position to portrait. This finely structured adjustable monitor arm can be tilted back up to 70 degrees and forward at 5 degrees. No one fancies a disorganized desk or office, and it is only proper to minimize the space used in order to maximize a neat and classy appearance. The provided desk clamp can be installed on the desk between 0.4 inches to 2.4 inches. When looking at the mounts holding ability it is great to see it can mount up practically any LCD monitors from 32 inches down. It will also hold up monitors that weigh as much as 25 lbs and properly position them for comfortable and suitable viewing. Monitor arms seem hard during installation. Monitor’s should always be positioned to suit your height, eyesight and sitting arrangements and the NB North Bayou Monitor Desk Stand Full Motion Monitor ARM is a single monitor mount that is perfect for the work environment. It’s fun-sized and contemporarily designed to increase comfort and enhance productivity regardless of the setup. The fully extendable arm allows users the liberty of sitting at ease and resting their shoulders and back while watching the screen at an ergonomically suitable level. It is universally designed to fit most 17-27 inch flat-screens and monitors that weigh up to 14.3 lbs and is VESA compliant. This phenomenal design provides one-touch angling and adjustment of the screen to the height and level that is most suitable for you. Once the monitor arm is set up, feel free to attune it to your preferred position. For the installation, it offers the options of fixing it in with a C-clamp or using a mountable grommet. All the hardware required for a successful and stress-free installation is included in your purchase package. These hardware tools are made of high-quality materials ensuring that the mount is firmly and stably secured to prevent any mishaps or wobbling of the screen. We have no doubt that this mount was constructed to go all the way! Knowing how much people treasure their viewing times the arms excellently circle and bend in all directions; 35 degrees up and 50 degrees down with 360 degrees view rotation. Make sure you also check our guide to the best gaming monitors. The way one person sets up his monitor definitely varies from another when taking into consideration getting the perfect lighting, diverse preferences and tasks. The HUANUO Dual Monitor Mount Full Motion Monitor Arm Stand lifts monitors to suit your specific viewing needs. The monitor arms are connected with gas springs which make it easier to make the necessary adjustments hitch-free. It is installed at the edge of the desk to ensure enough space is left to place other necessary devices, tools or documents. It includes a C-clamp for easy installation on a desk with not more than 2.36 inches thickness. The design is sure to fit most monitors that are within 15-27 inches in size keeping them off the table and awesomely propped up in the air. The Huanuo is a universal computer monitor stand that adequately holds up brands like Dell and LG that weigh up to 17.6 lbs with the appropriate VESA mounting patterns. This phenomenal double armed beauty has a swivel of 180 degrees and can tilt from a -90 to + 85-degree angle with the capacity to rotate 360 degrees around. The Huanuo wouldn’t be complete without its capable cable management system that clips up wires and cords keeping the desk space tidy. When viewing screen content, it is ergonomically required that the monitor should be at eye level and the screen should be kept at arm’s length. The VIVO Height Adjustable Single Monitor Arm works to achieve this. This monitor riser is able to lift most display screens to an appropriate height, and in return, clears up usable desk space. It’s a major organizational tool that will give your office or study space the extra ultra-tidy look it deserves. With a cable management system that holds up all AV and power cords together, you won’t have to bother about stacking them up elsewhere. To add to its ability to hold most screens of 13-27 inches and 14.3 lbs up, it is VESA compliant. This mount also provides the options of setting the monitor arm up with a C-clamp or a mountable grommet for desks that are up to 3.25” thick. To achieve good working conditions, the monitor arm is suitably adjustable providing a whopping 360-degree rotation. It will furthermore spin around at a 90-degree swivel and 90-degree tilt. Depending on personal preference the monitor can be placed in a portrait or landscape position. The installation of the VIVO monitor arm is quite simple; no tools are needed to place the monitor in. Once the display screen is set up it is impossible to ignore how this monitor arm gracefully and accurately displays it. Our handy guide to the best laptop stands features more great products like this. In this day and age with the foreknowledge of the dangers of inappropriate viewing habits, there is almost no excuse for indulging them. Straining your eyes and submitting your body to a certain position just to see or type better is not medically advisable. The Mount-It Triple Monitor Mount Height Adjustable Monitor Arm Desk Stand works great for users’ convenience. This mount may look like it crawled out of a futuristic robot movie where they finally take over the world! However, this triple monitor mount has come to put you in control of your space and the wide range of viewing options. The ultra-lengthy arms work great for simultaneously positioning all 3 monitors in certain placements to maximize working environments; the more arms the merrier. 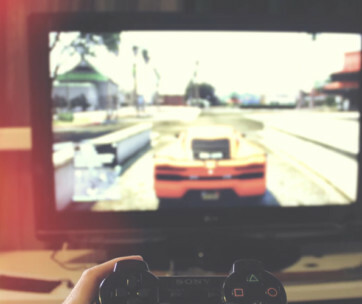 This option is equally great for users who love aligning their gaming sessions. Each individual monitor can adequately tilt to a (-/+) 90-degree angle and is able to rotate up to 180 degrees round. It comes with VESA head brackets that completely comply with the pattern requirements for monitors and flat-screen displays. Installation of this monitor bracket is quite easy with the use of a C-clamp or grommet. When setting up an office, home or shop desk, the ambiance, and style of the space need to be considered. While some offices need larger, multiple armed monitor mounts, others need more compact ones. The FLEXIMOUNTS Desk Monitor Mount has a simple yet exquisite design. This easy-to-use, classy piece provides maximum adjustment allowances via the gas springs. It enables users to change the position of the monitor to a more suitable one with just a single touch, be it the height or angles. The monitor arm can easily be tilted for an easier view or rotated at the monitor holder for a 360-degree view. To accommodate larger display screens, the tension can be screwed anti-clockwise to make the knob tighter. On the flip hand, to loosen up the tension, turn clockwise for monitors that are smaller in size. The cable management system provides a spacious allowance for wires and power cords to be placed freely clearing up re-usable space. The Fleximounts monitor arm has wide range compatibility among top brands such as the Samsung, Acer, LG, Dell, Asus flat-screen LCD and LED displays to mention a few. It will accommodate various sized monitors from 10 to 27 inches, and adequately set them up for your continued convenience. Installing this mount has been made very simple and fast thanks to the C-clamp and grommet options. Find more great products like this by checking out our guide to the best touch screen monitors. Instead of enduring the regular pains experienced after a long stressful day at work; staring at the screen from wrong angles, it time to take charge of your screen time. With the VARIDESK Full-Motion Spring Dual Monitor Arm, two monitors can be set up at the same time to maximize work or gaming experiences. One of the best advantages of using a dual monitor desk mount is being able to maximize productivity and share information at meetings or with co-workers conveniently. The arms are fully functional and able to turn in and out and be adjusted according to the height required. Productivity peaks when workers are able to comfortably and conveniently see what they are doing and access information easily. With the fully revolving hands that allow a 360-degree rotation, you can get the best view from the monitor. The monitor arm is able to support up to 19.8 lbs in weight which is suitable for most sizeable display screens. While the arm can be maximally extended at 29 inches, the height can be adjusted up to 12 inches ensuring that it accommodates all height and sizes regardless of whether you are 5,5ft or a 6,2ft. This monitor arm is also VESA compatible. It is highly recommended that when sitting at a desk, the eye level should be 2-3 inches lower than the top of the screen. It is said that the human eyes have more capacity to see clearly below the horizon line than above it. All these recommendations go to ensure people are not straining their eyes or necks just to view their screens better and the longer arms offer more flexibility and motions. 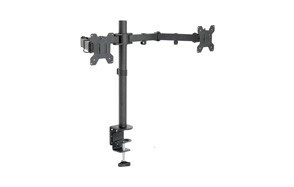 The Loctek D7SD Dual Monitor Mount is VESA compatible. Made with finely polished aluminum, it provides that posh and unavoidably attractive look while sitting pretty on your desk and comes with excellent adjustability all users will love and appreciate. The Loctek VESA monitor mount is compatible with all monitors that have the 75x75mm and 100x100mm pattern. The Loctek also uses gas springs which are very useful for swiftly adjusting the height of the screen or swiveling it round to achieve better angles. The monitors can be placed side by side and even aligned above and under each other. It is one of the only monitor arms that allow for such unique positioning. The use of Laptops and computers that are still kept on the desk cannot be completely ruled out, but by the rule of thumb, monitor arms are better for office use. 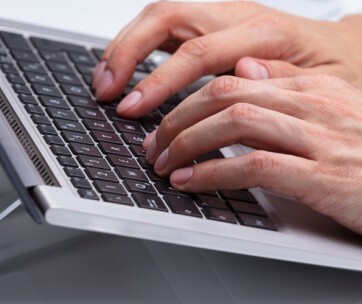 The reason is simple; a laptop display screen is quite close to the keyboard and will not be fully adjustable as a display screen on a mount is. The AmazonBasics Dual Modular Arm Mount provides the ease that people need to comfortably be productive at work. This particular monitor mount is made from lightweight aluminum that has proven to be quite strong and durable. The black metal arms have the capacity to hold up two monitors that weigh up to 22 pounds each. 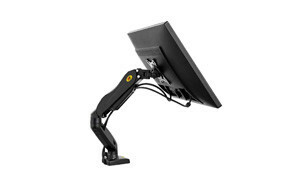 This mount will work with most monitors as it accommodates display screens of up to 30 inches. It is VESA compatible with monitors that have the 75x75mm and 100x100mm patterns. Adjusting the monitor has been made quite fast, a simple back and forward, up and down tilt will adequately reposition the screens. To further customize the arrangements, it provides a 7.3-inch range to adjust the height and tilt that goes 85 degrees up and 15 degrees down. Additionally, you will be able to rotate the display screen up to 180 degrees, facilitating an easy switch from a landscape to portrait view. With the AmazonBasics, users will also have access to both C-clamp and grommet options when setting up the monitor mount. Due to variations in height, most people do not necessarily have the same monitor preference. When solving a diversity problem, some brands go all out to accommodate everyone’s needs. Getting the best out of a monitor arm entails it providing a wide range of motions and movements that accommodate the ergonomic requirements of each person at every desk. The VARIDESK – Monitor Arm – Dual Monitor Arm 180 Degree understands this plight. 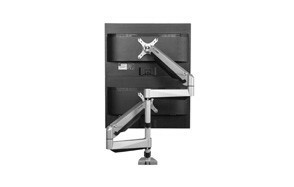 This agile and smooth-moving monitor wall mount ensures that both monitors can be moved around bump and hitch-free. The extended arms enable a 180-degree placement that allows the screen to rest on a wall’s surface. In situations where the office space is a bit tight, the Varidesk mount works great in managing such spaces via the 180 degrees display design. Each arm can adequately hold up to 6kg in weight; it is also VESA Compatible for monitors that have the specified patterns. Installing this dual monitor arm will be a breeze after which you can sit back relax and enjoy a great view.